Is it Dangerous or is Camping in the Crater the Ultimate Kilimanjaro Experience? Reaching the crater represents the ultimate Kilimanjaro climb, the point at which you genuinely feel like the ruler of all that you can see, but it’s also known as a cop-out spot among seasoned guides. It’s not the climbers who chicken out over the idea of camping at 18,700 feet, but some guides themselves. They blame it on the altitude or the hassle of spending the night, but more often, they’re simply not trained to help their climbers with this once-in-a-lifetime experience. Rather than miss out on what could become the highlight of your trek, opt for an experienced group. This is a grey area, literally and figuratively. It’s a frigid, forbidding place where you will likely get insomnia and possibly altitude sickness, but for the few who do camp there, it’s the highlight of their climb. Most companies don’t send their crews to the crater because of the extra costs of sleeping there. But the main reason is that most guides do not have the training to keep their climbers safe at this altitude. Most climbing companies don’t offer the ultimate Kilimanjaro crater climb as an option, citing safety as an excuse for not doing so. While some outfits offer it, the guides will say it’s not safe at the last minute at the crater rim and send their clients back to Barafu camp. The dishonest excuse they give is that it’s too hard for the climbers or they are not well enough to spend a night in the crater. The truth is they never intended to take them to Crater Camp. 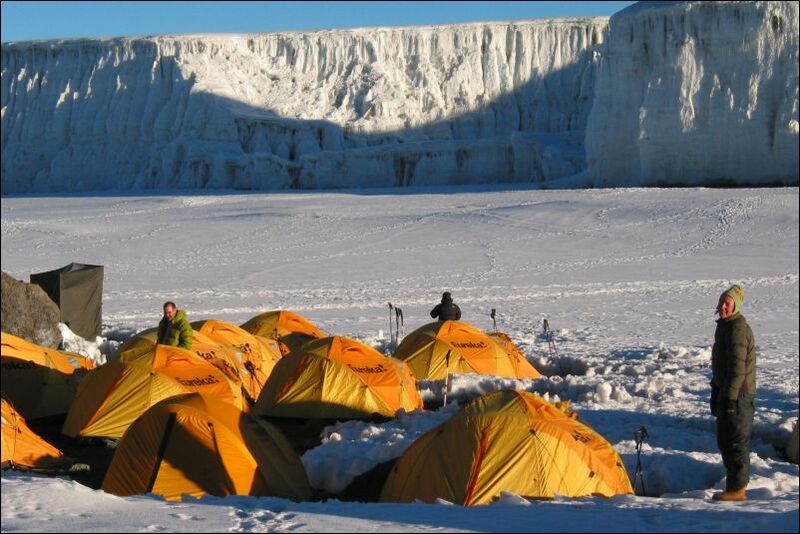 Tusker prides itself on camping in the crater on its 12 day Kilimanjaro climbs. It’s a chance to camp between glaciers and peer into the caldera’s 400-foot deep ash pit that is rarely seen. If you ever wanted to camp on the moon this is your chance. The big issue on the ultimate Kilimanjaro hike is the level of high altitude medical training of a company’s guides. If they have been properly trained they should be able to monitor their clients all day during their climb, looking for symptoms of AMS and treat it well before they reach the summit. Tusker puts its guides through regular specialized five day altitude medical course that none of its competitors can match. The crater is not for everyone. At night temps can be as low as -15 deg C., but for those who brave the long night it is well worth it. The photo ops are unparalleled, juxtaposing the ashen floor with the luminescent glaciers, set on a 1,300 foot wide caldera. There may be no other place to camp on a volcanic lunar landscape all alone without the crowds. Kilimanjaro’s crater is the highest campsite on any Tusker trek and Eddie has the confidence in his guiding teams to take you there safely. You can land safely on the moon atop Africa, if you have the best guide to support you. Discover more about how to prepare for the ultimate Kilimanjaro hike.